Designed in France, the ultra-compact Toyota IQ Concept aims to challenge conventional thinking about what the press release refers to as automotive hierarchies. The vaguely cephalopod-like maritime shape suggests the car may harbor a 40-shrimp team hybrid synergy powerplant. Actual press release after the jump. The IQ concept represents a paradigm shift in small car design, a concept car that challenges conventional thinking of automotive hierarchies: small yet spacious, premium yet small. Realized through the vision of an ultra compact, highly space efficient, environmentally friendly vehicle that maximizes the urban lifestyle of Europe's fashionable metropolitan dwellers. The IQ concept was created at ED2, Toyota's advanced European design studio in the south of France, working under the Toyota design philosophy of Vibrant Clarity - design that is forward looking, intelligent and energetic while retaining a clarity of purpose and function. 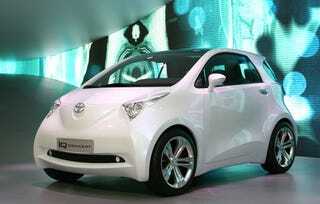 "The IQ concept is designed to reflect and enhance the lifestyle of its owners. In an urban environment, people want to express themselves through dynamic and on-the-edge design, but at the same time rational factors such as size, functionality and CO_ emissions cannot be ignored. Bringing these contradictory aims together in synergy was critical to the IQ concept, and is a way of thinking we call the 'J-factor', a philosophy at the heart of all our activities." Just a palm shorter than three meters in length - at 2.98 meters precisely - the IQ concept is a radical new approach to vehicle packaging and design. It challenges the current limitations of ultra-compact urban transport by offering an interior capable of seating four or three adults and luggage space - a unique versatility within a minimal footprint. The unveiling of the IQ concept also reinforces Toyota's commitment to reducing vehicle emissions through vehicle concept innovation. With increasing traffic congestion in urban areas, and rising concerns about vehicle emissions, the IQ concept presents a step change in vehicle packaging and footprint, to ensure a sustainable future. Expressing the structure and construction of the vehicle is vital to keeping the design simple yet at the same time energized, it also serves to clearly express the concept of the car. The structures around the 17 inch tyres form part of the minimal front and rear overhangs, a synergy that conveys both strength and agility. Overall, the IQ concept has a 'on-the-edge' style ready for the streets of tomorrow's urban environment. This sense of vibrant, urban sub-culture is carried forward by the unique exterior colour; pearlescent white with flecks of purple shimmer hinting at the darker interior treatment. The senses are further stimulated by the touch of the mock snake-skin steering wheel trim, purple interior accents and purple styling themes carried over into the seats, door trims and dashboard. The IQ concept sets out to be, and succeeds, as the world's smallest four seat passenger concept car. At less than three metres in length (2980mm) it is 425mm shorter than the Toyota Aygo and more than 770mm shorter than the Toyota Yaris. Yet, in width and height (1680mm x 1480mm) it is comparable to Yaris - so the ultra compact exterior dimensions hide a big interior heart. At the same time, the IQ concept is versatile and practical. It will seat four with space for three adults and a child - or the fourth seat can be utilised for luggage space. To achieve this, a radical and intelligent 3 + 1 seating concept has been applied. With a dashboard that swoops away from the front passenger, this seat has been given extra freedom of movement. Atop the main dashboard sits the instrument pod, dark and mysterious with the swoops and curves of a manta-ray; its tail flashing in silver-chrome trim as it reaches down to form the cleanly-styled centre console. A single central dial provides control of interior environment with temperature and ventilation displayed on the central panel, clearly placed in the driver's eye-line. The three-dimensional, 3-in-1 display of speed, engine rpm and fuel status is mounted above the steering column while controls for audio and navigation functions are on the steering wheel itself. In an intelligent, hi-tech solution to urban navigation, a stand-alone, head-up display of the GPS route-finder is placed within the driver's vision but is see-through when turned off. A panoramic glass sun-roof ensures plenty of light and adds to the sense that passengers are not confined within a conventional compartment. At night, the darkened interior is mysterious - further emphasising the high fashion sense of the concept car.